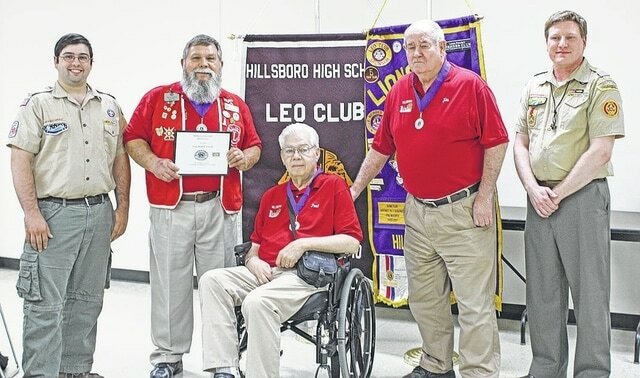 Hillsboro Lions Club members receive awards for their service to Boy Scouts and the Lions on June 25. Three Lions received the Scouting Service Award for Distinguished Service to Scouting from the Lions Club. They were recognized for their service to Cub Scouts and Boy Scouts covering over 50 years. This is a relatively new recognition for Lions. The Hillsboro Lions are the first to receive the recognition in Ohio. Pictured are Bill Locke, Chief Logan district executive; Lions David Lowell, Paul Johnson and Jim Ferrell; and Jay Lockard, District Director Southern Area, Chief Logan.